By becoming an Honors College student you are joining a community of scholars who have a distinct advantage for achieving academic excellence. With a multitude of benefits to membership from a flexible curriculum to specialized advising, joining the Honors College is a holistic approach to higher education. As a result students are able to delve more into their field of study, and still have time to experience all that college life has to offer. Review the information below to see if the Honors College is right for you! Benefits of Membership - Explore the many benefits of joining the Honors College. Admissions - Review the requirements for joining the Honors College as an incoming freshman or current Auburn student. Honors Ambassadors represent the best the Honors College has to offer. Each year 14 Honors students are chosen to represent the college. Through recruitment events and other university sanctioned activities, these students serve as a liaison between prospective and current students. 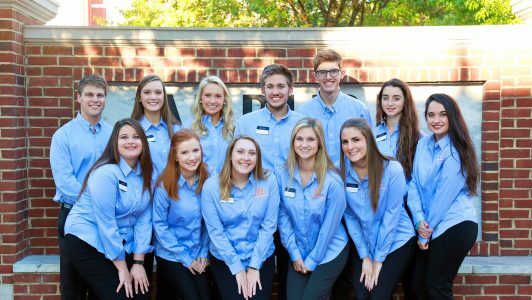 Our ambassadors are here to help with any questions future students, or their families, may have about the Honors College or life at Auburn University.